The Association for Human Rights in Central Asia (AHRCA), Civil Rights Defenders (CRD), Freedom House, International Partnership for Human Rights (IPHR), the Norwegian Helsinki Committee (NHC), Reporters Without Borders (RSF) and the Uzbek–German Forum for Human Rights (UGF) are extremely relieved to learn that Uzbek journalist Muhammad Bekjanov, the winner of RSF’s Press Freedom Prize in 2013, was released today after 18 years in prison. 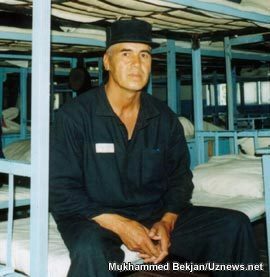 The onetime editor of what was Uzbekistan’s leading opposition newspaper, Bekjanov was one of the world’s longest imprisoned journalists. Now aged 62, he was repeatedly tortured following his arrest in 1999 and his sentence was extended just before he was due to be released in 2012. According to initial information, he will not be allowed to leave the country for one year, which means he would not be able to join his US-based family during this period. As the editor of Erk (Freedom) in the early 1990s, Bekjanov tried to initiate a debate on such taboo subjects as the state of the economy, the use of forced labor in the cotton harvest and the Aral Sea environmental disaster. His brother, the well-known poet and government opponent Muhammad Salikh, was the only person to run against President Karimov in the December 1991 election. Karimov took advantage of a series of bombings in Tashkent in 1999 to silence outspoken critics by prosecuting them as accomplices to the attacks. Like many pro-democracy activists, Bekjanov was tried in this way and sentenced to 15 years in prison. He was arbitrarily given an additional sentence of four years and eight months in prison in February 2012, just a few days before he was due to be released. Bekjanov has lost many teeth and much of his hearing as a result of mistreatment in prison and a serious case of tuberculosis that was left untreated for a long time. In recent years, he has suffered from intermittent acute pain as well as permanent discomfort from an inguinal hernia that developed when he was assigned to prison work making bricks. Uzbekistan is ranked 166th out of 180 countries in RSF’s 2016 World Press Freedom Index. A few political prisoners including human rights defender Bobomurod Razzakov and politician Samandar Kukanov have been freed since Karimov’s death in August 2016. But many other journalists, human rights defenders, opposition politicians and civil society representatives continue to languish in prison. Read article "Tvangsreturnert tadsjikisk aktivist takknemlig etter løslatelse"
Read article "– Kasakhstan må løslate Iskander Yerimbetov"
Read article "Tadsjikistan løslater politiske fanger"